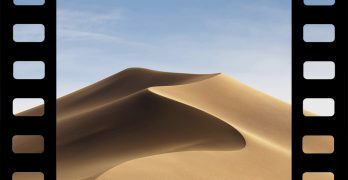 Troubleshooting a Mac can be a pain, especially if you suffer sudden app crashes or kernel panics frequently. And if you click through an error message accidientally, where does it go? Fortunately, it’s saved in an application called Console. 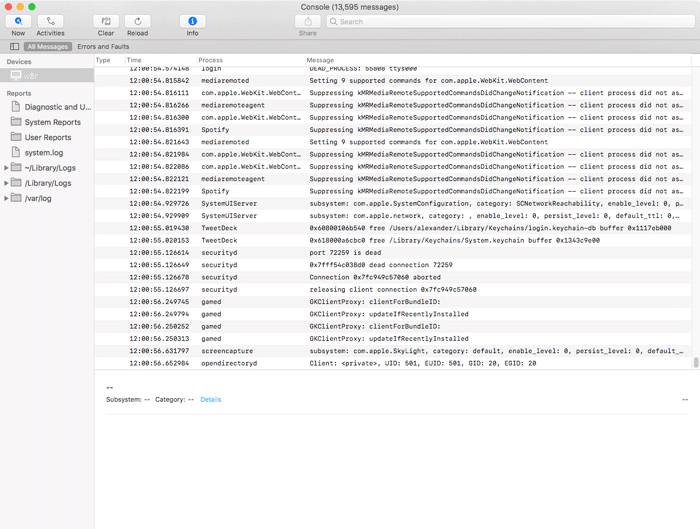 But what do those Console messages mean, and how can you interpret its logs to troubleshoot Mac problems? Read on to find out more. 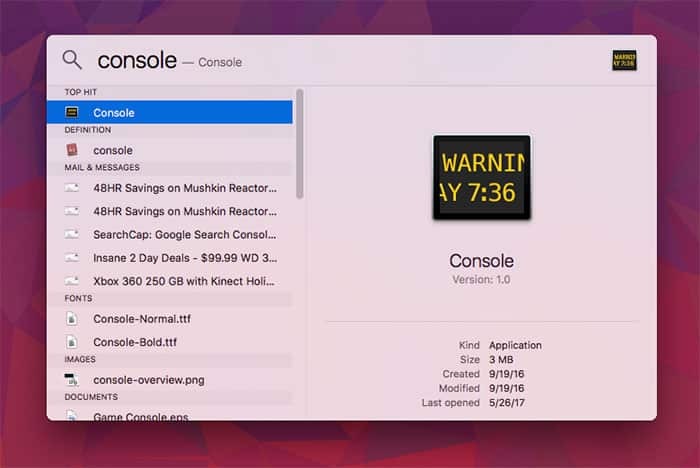 Console is the application that collects log messages from your computer for user review. All the messages from application crashes, system crashes and everything else get funneled into this one application. It collects errors, faults, warnings and even boring “here’s what I did today” messages from applications, daemons and system processes. 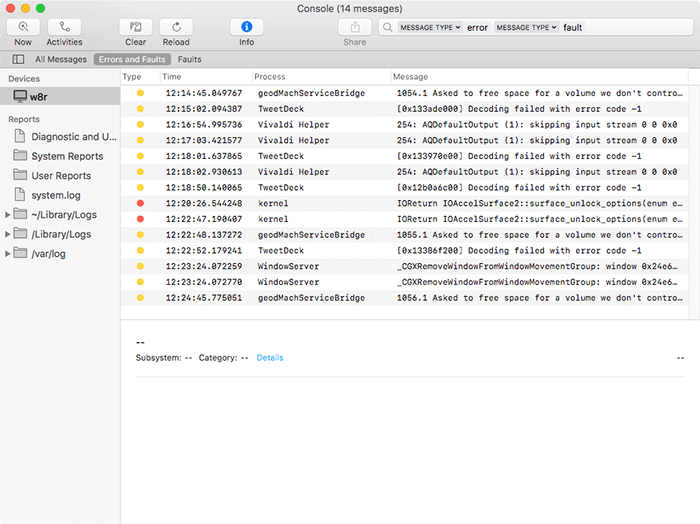 If you need to get a look at some logs for troubleshooting, Console is where you start. And it should be your first stop after your computer experiences a random restart, kernel panic or application crash. You can find the Console application with Applications/Utilities/Console.app. You can also type “Console” into the Spotlight or Launchpad search bars, as see below. The first time you open Console, you’re going to be drowned in a barrage of real-time system logs. The vast majority of these are totally unimportant unless something goes wrong, and the deluge makes any single message impossible to read among all the status updates and event logs. Of course, it’s not completely useless. Real-time reporting is essential if you want to see what sort of result an action has. 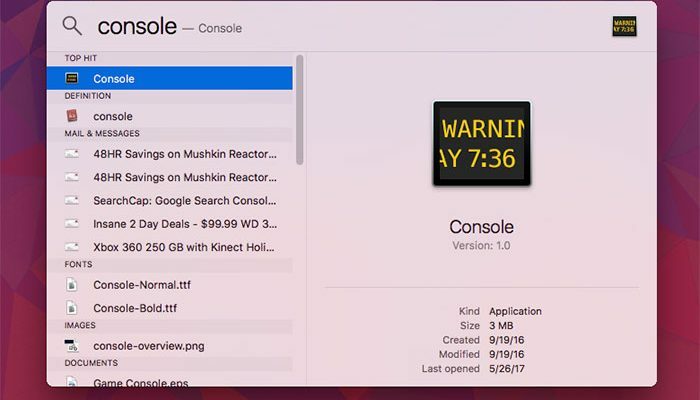 For example, if you want to see if Safari generates an error when closing a particular tab, you might open Console and Safari simultaneously, close Safari, and see what messages get logged to Console. Outside of that particular case, though, it’s just TMI. Before you start doing any major troubleshooting, let’s quiet things down. You can toggle off Console’s stream of consciousness by clicking the “Now” button in the upper-left. You can also scroll up, which freezes the application at the scrolled input field. New messages are still getting logged to the Console. You’re just not getting auto-scrolled to them anymore. We can also wipe the slate clean to see only the newest log messages. To remove currently visible messages from the Console, click the “Clear” button in the menu bar. This will let you focus on just what’s happening now. The view will be reloaded soon after you click Clear, and new log messages will begin to appear. The thing is, we probably don’t care about what Finder had for lunch or how Safari’s kids are doing. We just want to see the drama, just the problems. 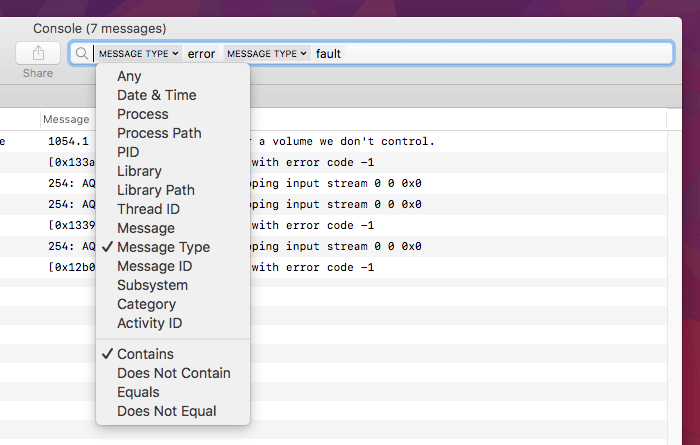 Click “Errors and Faults” below the menu bar to hide everything that isn’t a message about a problem. This automatically opens a pre-saved search that filters based on message type. If you want, you can create your own searches by manipulating the search bar. If you’ve made a custom search you like and want to save it to the filter bar, click the “Save” button. Now that we’re only looking at the problems, let’s figure out what the system is trying to tell us. The messages are sorted by severity based on the color of their associated dot, found under the “Type” column. Faults, the most serious console message, get red dots. Errors, which are more like warning messages, get yellow dots. The “Process” column contains the name of the application or system process that generate the error messages. Some of these names will be familiar, but others will be cryptic mysteries that you’ll need to Google. 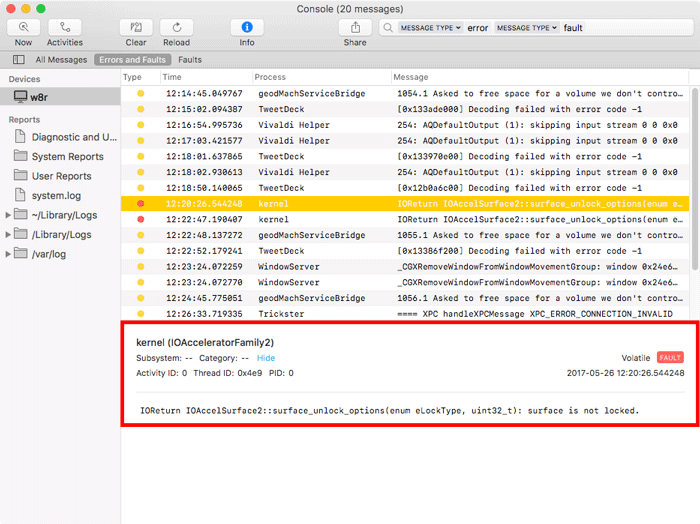 Note that the most serious faults are typically spawned by the “kernel” process, which runs the core of macOS. 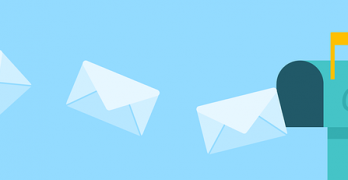 To reveal a little more detail about a particular message, click on it and check out the info pane at the bottom of the window. The info window returns a lot of cryptic information for non-expert users. On the top we see the process that spawned the error message, along with the specific sub-process in parentheses. We also see the type of error and the time and date that it was logged to the system. The meat of the message is at the bottom, under the horizontal rule. This is the actual message that the kernal logged to the system, trying to explain what went wrong. It typically starts by saying what particular part of a program spawned the message before describing what the issue is. In this case I can see that IOReturn is complaining that it can’t unlock the IOAccelSurface2 because the surface is not locked. It’s not important if you don’t know what this means right way, but it often gives you a unique phrase to search. Googling this error leads me to believe it’s a bug with TeamViewer, but its not critically important. It can be helpful to take a screenshot of error messages for later, or for sharing on troubleshooting forums. If you see that an particular application is generating lots of faults or errors, try updating to the most recent version. When Should I Check the Console? Console is most useful when your system has just experienced an error. Maybe an application failed to open and you received a System Report window about it. Or maybe you just rebooted following a kernel panic. Inspecting the Console will help you dig up the cause of the problem and take the necessary steps to fix it.